Northern Ireland's five health trusts spent almost £12m hiring staff through a Scottish nursing agency in the past financial year. The SNG is believed to be one of the UK's highest-paying nursing agencies. The company offers "market-leading pay rates" and "travel expenses wherever you go", according to its website. The employment search engine indeed.co.uk lists the average hourly rate for a Belfast theatre nurse as £42.49 - £75k a year based on a 37.5 hour working week. A Northern Ireland-based staff nurse - employed by the NHS - is paid between £11.21 and £16.05 per hour, on average, or £21,910 - £31,383 a year. The Northern Health Trust had the biggest spend and increase - from £1.7m in 2015/16, to £4.2m in 2017/18. Last year, the Regulation and Quality Improvement Authority (RQIA) formally notified the Department of Health about the "worrying picture". 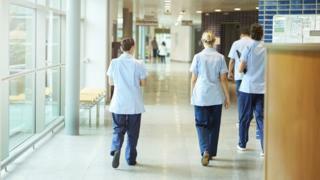 Speaking to the BBC, RCN Director Janice Smyth said the "overuse of agency staff" is having a demoralising effect on staff nurses, who are often doing the same work as agency nurses for a fraction of the pay. "Many nurses now find themselves in a position where they're working alongside someone doing the same work but earning vastly different sums," she said. "We heard today from a nurse who was working for £14 an hour alongside another nurse doing the same work for £60 an hour through an agency. "That situation should never have been allowed to develop, but it's here and the only way out of it is to pay our nurses properly, train more nurses - as we're doing - and to make sure the pressures on the workforce are reduced." "This situation has been developing for a number of years and it goes way back to when we started to reduce the number of nurses that we were training here and that was compounded by short-term cost saving measures which froze vacancies and slowed recruitment," she said. "When you have decreasing numbers of nurses combined with increasing demands on services, you have increasing pressure on staff and agency work becomes an alternative for some nurses and that industry grows and the cost of providing nurses becomes extreme." Image caption Janice Smyth said nurses needed to be "appropriately rewarded". She said the solution to the problem was "proper workforce planning, which is just beginning to be addressed now" and ensuring nurses "are appropriately rewarded for the job they do and that they're as highly valued in our country as they are in the other countries in the UK". Ms Smyth added: "The pressures in the system do significantly impact nurses' health and wellbeing and then they make decisions about whether they stay in the profession or they don't and it does affect their sickness and absence from work. "There is plenty of evidence that if you value the workforce and treat them well, your business, regardless of what it is, does much better and is much more stable." A Department of Health spokesperson said: "Trusts employ agency/locum staff for several reasons, for example, cover for sickness and maternity/paternity leave; cover for existing vacancies; and when demand increases over the winter months. The primary aim of this is to ensure that safe and effective services are sustained at all times for patients and clients." The spokesperson said the department recognises that "increasing agency and locum costs are not sustainable, particularly at a time of serious financial pressures right across the public sector". She added: "This is why transformation of health and social care in Northern Ireland is such a priority. "The Health and Social Care Workforce Strategy 2026: Delivering for Our People, which was published by the Department in May 2018, sets out ambitious goals for a workforce that will match the requirements of a transformed system addressing the need to tackle serious challenges with supply, recruitment and retention of staff. "In the meantime, maintaining services with safe staffing levels occasionally requires us to use higher-cost agency staff."